Just in time for Valentine’s, I’m celebrating true love with this extra-special dessert marrying two of my most favorite flavors: coffee and maple. 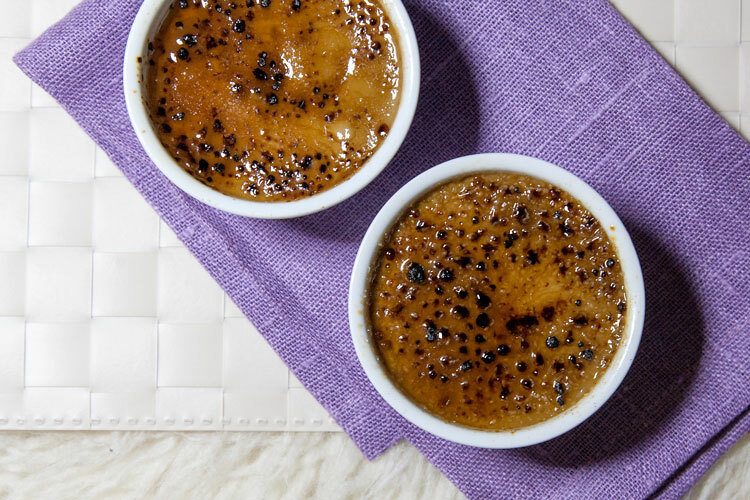 If you’re looking for more of a purist creme brulee experience, you can leave out the coffee and substitute regular granulated or turbinado sugar for the maple sugar. 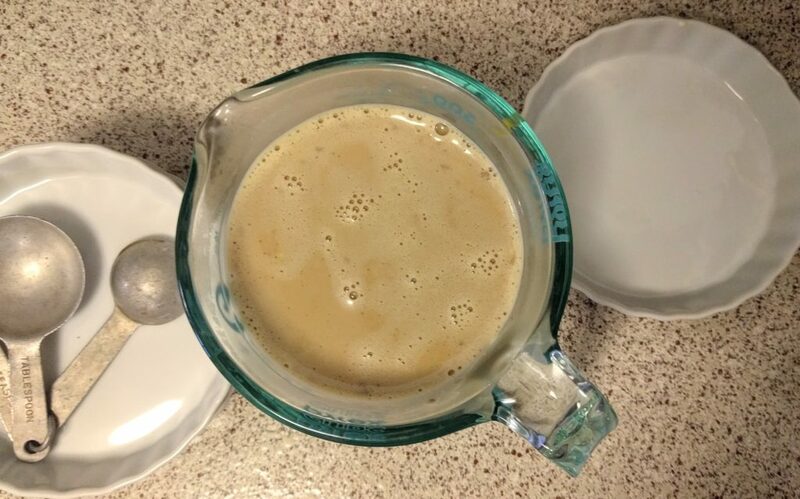 But that’s not going to happen in my kitchen, because check out this custard mix… like a big, creamy maple latte – mmmmm! 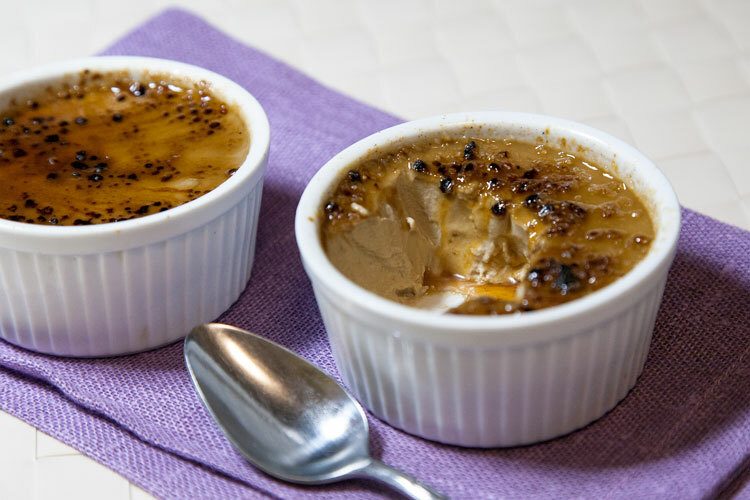 I started my initial experiments using some of those special extra-shallow creme brulee ramekins (like in the photo above), but only achieved limited success. They needed to be stacked one-per-layer, and even when shaping their aluminum foil covers to allow air flow between each one, I had issues getting them evenly cooked. I switched to the more common deep-dish 4 oz. ramekins, and have been much happier with the results. Using 4 oz. ramekins, one batch of this recipe can be poured into either 4 or 6 servings. The custards in these photos were a batch of 4, which yields picture-perfect filled-to-the-brim desserts, but I’ll admit they require very delicate handling to avoid spillage. Scaling to 6 servings makes for tidier work, and more moderate portion sizes. Most creme brulees I’ve tasted are on the extremely sweet side. My preference is to call for much less sugar in the cream mixture than typical recipes, which gives the candy-sweet top layer a chance to contrast with the intensely rich, bittersweet coffee custard underneath. 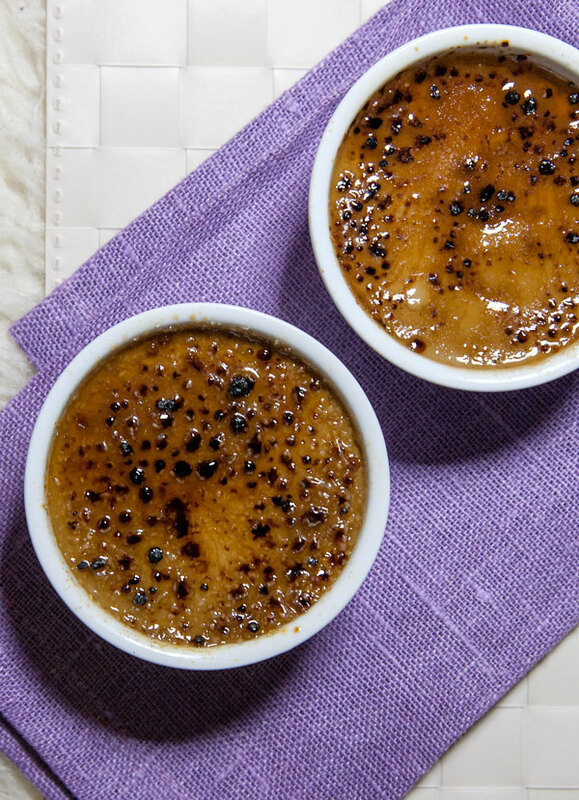 If the maple sugar you use is a very fine grain powder, it can be difficult to achieve the same crackly crust typical of a traditional cane-sugar creme brulee. To combat this, you can optionally substitute a portion of the maple sugar in the topping with coarser turbinado or granulated sugar. These types of sugar can also be substituted entirely if maple sugar is unavailable, but the maple sugar is much more complexly flavorful. Whole vanilla bean can be used in place of vanilla extract; if making this substitution, add the vanilla to the cream when beginning to heat it, and remove it before pouring the custards. Prepared in 4 oz. ramekins, this size batch can yield 4 or 6 servings. If you don't have a kitchen torch available, the sugar topping can also be carefully caramelized under your oven's broiler. Prepare the pressure cooker by filling it with 1 cup of water and placing a raised trivet or rack in the bottom. In a small bowl, gently mix the egg yolks, maple sugar and salt. Gently heat the cream: put the cream in a small saucepan over medium heat until steam just begins to rise from its surface (do not boil). Alternately, the cream can be heated in a small bowl or large measuring cup in the microwave, carefully watched in 45 second cooking increments. After removing the cream from the heat, stir in the vanilla extract and espresso powder. Temper the egg yolks by pouring in 1-2 tablespoons of the warm cream mixture and gently whisking it in until smooth. Slowly pour in the rest of the cream and gently whisk to combine (try not to create too many bubbles). Pour the mixture into four or six 4 oz. 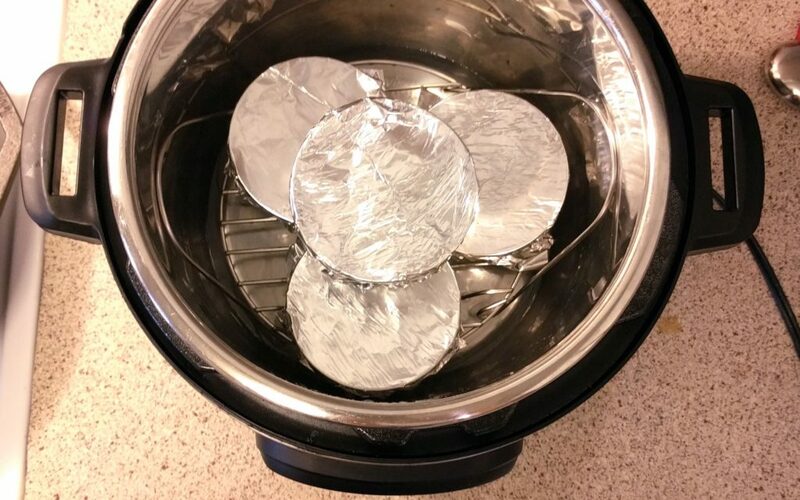 ramekins, and cover each with aluminum foil. Carefully arrange them in the pressure cooker, stacked on top of the trivet in two layers, spaced evenly. Cover the pressure cooker with the lid, ensuring that the valve is in sealed position. 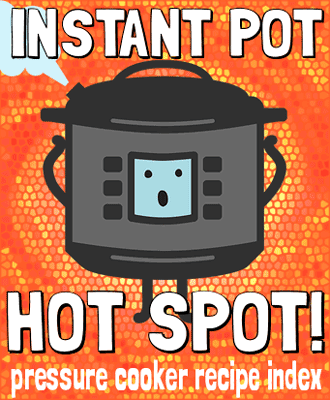 Cook under high pressure for 10 minutes (with Instant Pot, choose ‘Steam’ mode, and leave time adjusted to 10 minutes). When the cooking time is complete, allow the pot to de-pressurize naturally for at least 10 minutes before opening the lid. Carefully transfer the ramekins to a rack to cool for 30 minutes, then chill in the refrigerator for at least 2 hours. The custard can be prepared to this point up to 3 days ahead of time before serving. To finish, sprinkle about 1 1/2 teaspoons of maple sugar in an even layer over the top of each custard. Light a butane kitchen torch and carefully pass its flame over the surface, moving continuously, until the sugar bubbles and caramelizes. Serve immediately. 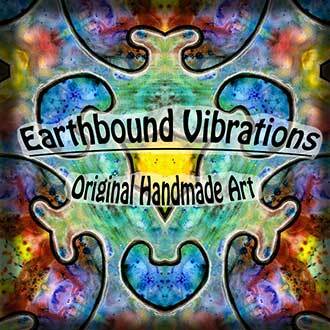 Wow, this sound amazing. Espresso and maple is a great combination. Mary, thank you for this post. Its very inspiring.